500gr / 1.1 lb. white asparagus. To prepare them, remove about 2cm / 1/2 in. from the bottom end of the stalk, this takes off the woody part, then peel them with a vegetable peeler to remove the outer, stringy layer. 1. Place the asparagus in a large pan. Add water from a recently boiled kettle to cover them generously. Add some salt. Cook the asparagus for about 7 minutes at a gentle boil. Once the asparagus has had 7 minutes, it should be almost ready. You can check by spearing the thickest part with a sharp knife. If the knife goes in quite easily, with only very little resistance it is ready. Place your slices of ham in the pan, cover it with a tight fitting lid, take it off the heat and set aside for 2 minutes. 2. Cut the asparagus into pieces of about 2cm / ½ in. in length. 3. In a bowl beat the eggs together with a fork then add the asparagus, ham, parmesan, herbs, salt and pepper and mix through. 4. Heat the olive oil in a non-stick frying pan on a medium heat and then add the egg mix. 5. Agitate the mix a little to allow it through to the pan surface so that it cooks. I like to pick up the pan and let the egg mix swirl around and touch the sides to cook. 6. Push the sides of the frittata down all round the pan, this just loosens it a little making it easier to turn. Cook for about 3 to 4 minutes. The idea is to get it cooked and set as much as possible before turning. 7. To turn the frittata over, remove your pan from the heat, place a plate on top of your frittata. 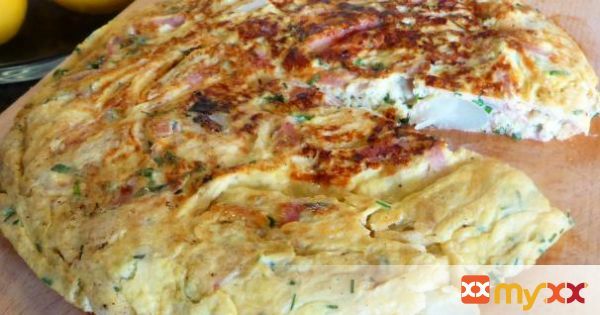 The plate should be big enough to cover the complete top surface of your frittata. Then in a swift, confident movement, place one hand on the base of the plate and turn the pan upside down, then slide the frittata from the plate back into the pan so that what was the top becomes the bottom. 8. Put the pan back on the heat and cook for a further 3 to 4 minutes, then serve. 10. If you are not feeling confident enough to flip your fritatta, you can always put it under the grill to brown the top. Remember to use a pan that has a handle which can take the heat if you use this method. Although, flipping is much more fun!